A VPiX 360 Degree Virtual Tour, like the one for #5 Autumn Glory Lane, gives you have a complete understanding of the interior of a completed Stonecraft home. This virtual reality can be viewed on Samsung Gear VR, Oculus and iPhone and Android devices. 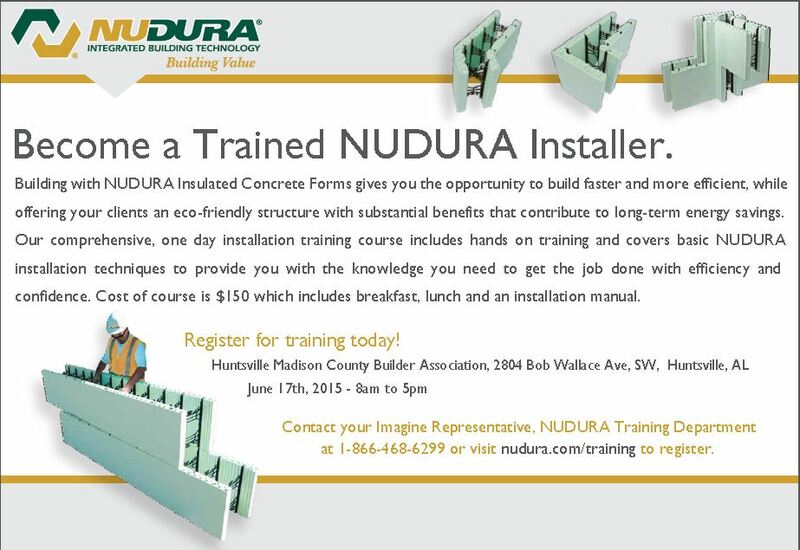 Expired: NUDURA Installation Training Session Coming Up June 17, 2015. Imagine Inc. is looking to create two new positions: Part Time Commission Sales & Team Leader for our Residential Construction Sites. 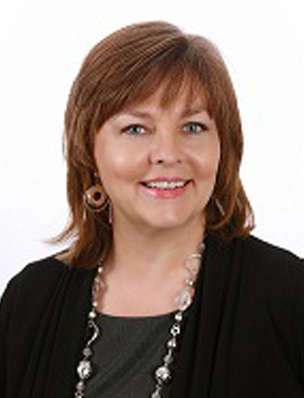 Job descriptions will be posted on Craigslist & our LinkedIn Profile and can be accessed via the link below. If interested in either attached position contact us at: imagine@uimagineit.com. Go out and support all the local builders of Huntsville & Madison. We chose not to enter our Model Home for the Spring Tour as we’re still in the design process. If you’d like to see our latest and greatest project please contact us at imagine@uimagineit.com and we’ll schedule a tour for you. The Building, Home & Remodeling Show℠ hosted by the Huntsville Madison County Builders Association is the premier event for building, remodeling, home and garden products in the North Alabama area. For over 25 years, the Show℠ has brought consumers all the latest trends and technology for the home under one roof allowing them the opportunity to see, learn about and buy the latest products and services from reputable companies they can trust. Come visit our booths (911-912), March 6 – 8, 2015, to see what’s new in the world of Imagine Inc.
2014 Parade of Homes – We’d love to have you visit! Nestled among mature trees at The Preserve at Clayton Pond, STONECRAFT CONSTRUCTION a division of Imagine Inc., is crafting another sought after designed Insulated Concrete Formed (ICF) home. Left unfinished inside to showcase the structural and energy efficient benefits latent in an ICF structure, such as, eleven inch thick exterior walls with six inch monolithic rebar reinforced concrete. Walls and roof structure are made to withstand strong storms, while providing energy efficiency and comfort within. From I-565 go South on Memorial Parkway and take Weatherly exit. Take Weatherly Road and turn right onto Bailey Cove, left onto Green Mountain Road, right onto South Shawdee, right onto Valley Green. Take a right through the gates of The Preserve at Clayton Pond. Autumn Glory is past 1st intersection on the right. Stonecraft Construction on WAFF – June 26, 2014. In an interview for WAFF, Danesh Foroughi speaks to the merits of building with Insulated Concrete Forms (ICF Construction). Scroll to the three minute mark to see what Danesh has to say. 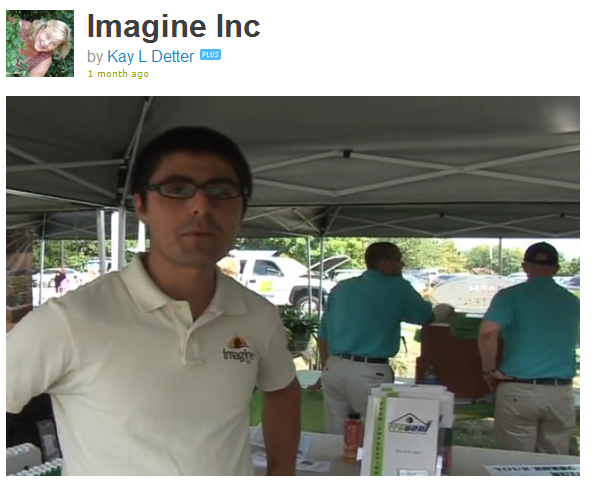 Watch the video for further information on the services offered by Imagine Inc.’s two divisions of Stonecraft Construction and Truseal Insulation. Please refer to the previous news article for details on this post. Winners were chosen in six categories: Light Commercial, Heavy Commercial, Unlimited Residential, Large Residential, Small Residential and Multi Family. 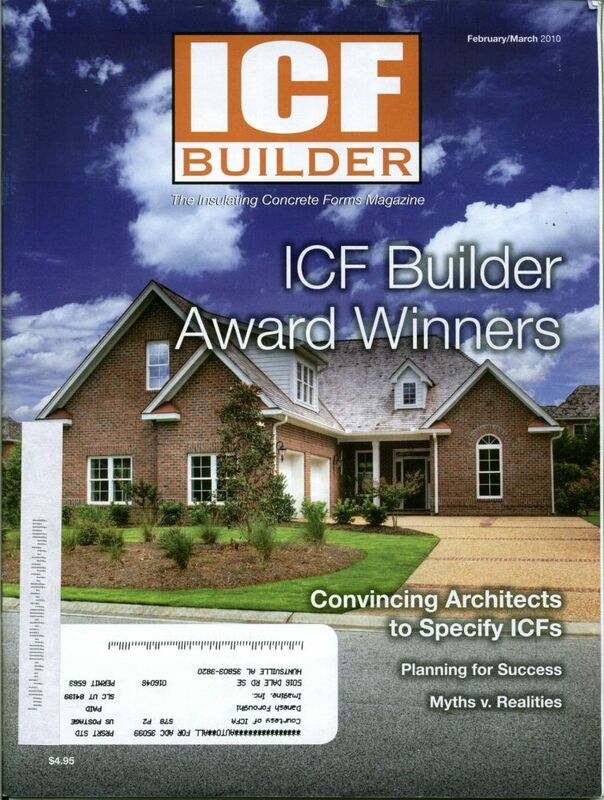 The 2009 ICF Builder Awards were the most successful industry-wide competition in history. ICF installers continue to set new benchmarks in sustainability, energy efficiency, and speed of construction for the entire construction industry, and nowhere is this more evident than in the projects presented below. These are the winners of the 2009 ICF Builder Awards, a worldwide competition that showcases the projects that have advanced the entire industry. This year we received more than 50 entries from three continents, with 15 different types of Insulated Concrete Form represented. Every single entry we received was noteworthy and impressive. 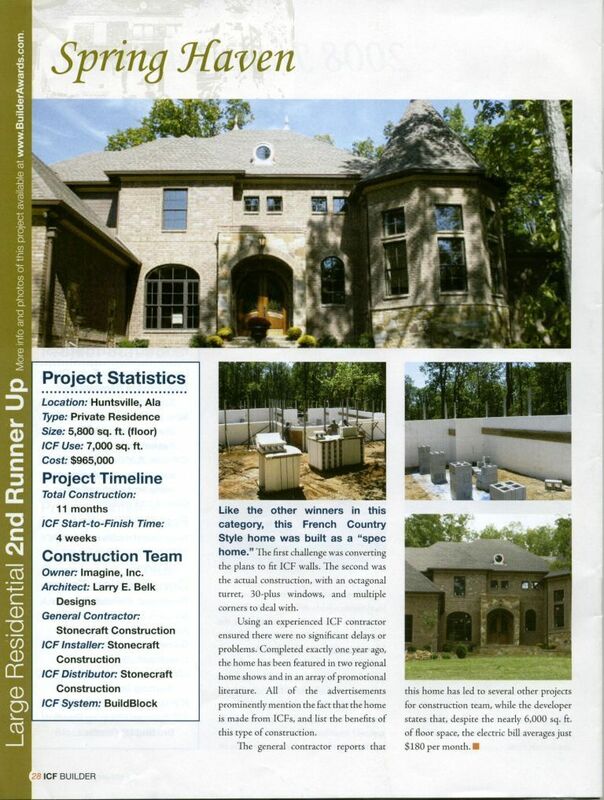 The winners, profiled on the following pages, represent the best-of-the-best, the very finest ICF buildings on the planet. A panel of judges selected a winner and two runners-up in each category based on the criteria below. Complexity, creativity, site challenges, and media exposure, were all factored in determining which projects had done the most to advance the industry.